Not all women with large breast are comfortable with their bodies. Some women are wondering how to reduce breast size without having surgery. Here are some ways you can wear your clothes more comfortably without having to worry about large breasts. Choosing the right type of clothes can make you look like you have smaller breasts. Avoid wearing light colored clothes and instead, choose those with darker colors to reduce your breast size. These shirts look good on women with large breasts because they avoid the “uniboob” look. Look for minimize bras which visibly reduces your breast size. Avoid shirts that are low cut and replace them with those that flare at the bottom, which shifts the gaze away from the breasts. Choose blouses that fit right because tight tops make your breasts look larger. Excess body fat can make your breasts look larger, so changing your eating habits can help reduce breast size. Eat foods with less fat and fewer calories to lose weight and have a smaller chest. To lose weight, the U. S. Department of Health and Human Services recommends consuming food servings with fewer than 400 calories and 5% of the daily value of fat. Choose your snacks smartly, avoiding fast food, cookies, chips, ice cream, and other foods between meals. Instead, opt for low-fat dairy products, fruits, and vegetables that have more nutrients with less calories, fat, and sugar. To prepare healthier meals, stock up on healthy foods like lean meat, turkey, skinless poultry, fish, fruits, vegetables, whole grain breads, and low-fat dairy. Cardiovascular workouts can reduce your overall body fat and can increase your heart rate, resulting in overall improved health. As you burn more calories and fat, your breast size will also reduce. Do these cardio exercises at least 3-4 times a week for best results. Running. If you are a beginner, start with brisk 10-minute walks and alternate with 30 seconds of running and one minute of walking. Do this for about 3 days in a week, increasing the amount of time running and decreasing the time of walking. After some time, you should be running for 20 to 30 minutes continuously. Swimming. This is a full body exercise, which burns more calories. If you spend 30 minutes doing the breast stroke and you will burn about 400 calories. Cycling. This is an excellent cardio workout, whether you do this indoors or outdoors. It increases your endurance while burning a lot of calories (250-500/30 minutes), depending on the speed and amount of resistance used. Team Sports. Team sports for women like volleyball or tennis can promote weight loss, improve overall health and foster camaraderie between team members. Bench Press. While lying supine on a bench or floor, pull abs in tightly and flatten the lower back to the bench using dumbbells. Start with weights directly over your chest, with elbows at 90 degrees. Press your arms straight without locking, and then go back to starting position. Do one to three sets of 12-16 reps.
Push-ups. Pushups are an excellent way to improve the chest without using any equipment. Start on all fours and place your hands a little bit wider than your shoulders. Walk your knees back and lean on your hands. Flatten your back from the neck down to the back of your knees. Pull your abs in and bend the elbows, keeping the back straight to lower your body toward the floor until your elbows are at 90-degree angles. Push up and repeat the procedure, doing one to three sets of 10 to 16 reps.
Pec Deck Flys. 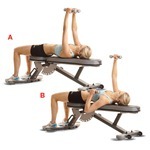 To do these, sit in the pec deck fly machine with your back leaning against the seat. Place the forearms on the padded lever. Your upper arms must be parallel to the floor. Slowly push arms in front in an arc, squeezing your chest until your elbows meet in the middle, in front of your chest. Return to starting position and repeat. Dips. Begin the triceps dips by sitting on a chair with your hands next to the thighs. Balance your weight on your arms by moving your rear in front of the chair with legs straight or bent. Bend your elbows and lower the body a few inches, with your shoulders away from the ears and going not lower than 90 degrees. Push the body back up to starting position. Repeat, doing 2-3 sets of 8-12 reps.